Get on “Tangenziale est” (Eastern Ring), leave the highway at the “Rubattino” exit. At the roundabout, turn left, then right at the traffic light. Straight for 500 meters, and you’ve arrived. Distance from the highway: 800 meters. From Piazza San Babila, take Corso Venezia and then keep going in Corso Buenos Aires. When you get to Piazzale Loreto, take Via Porpora (second right). Go all the way down Via Porpora, go through the railway underpass. Take a right at the 2nd traffic light, then 1st left, 1st right, 1st left. Distance from San Babila: 4 km. Take the walking underpass on the left handside. Then take a right at the 2nd traffic light, then 1st left, 1st right, 1st left. Distance from the metro station: 500 meters. At the Via Ventura 3 gate, ring “Cowo® Monkey”: welcome! © Copyright Monkey Business/advertising in the jungle Milano 2008 - 2018 - Partita Iva 12427840157 - COWO® è marchio verbale e registrato. 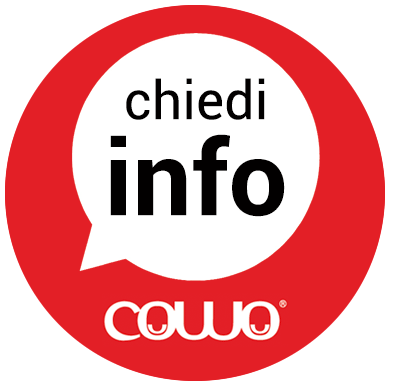 Tutti i diritti riservati - COWO® is a registered trademark, in visual and wording. All rights reserved. di Via Ventura 3 a Milano.